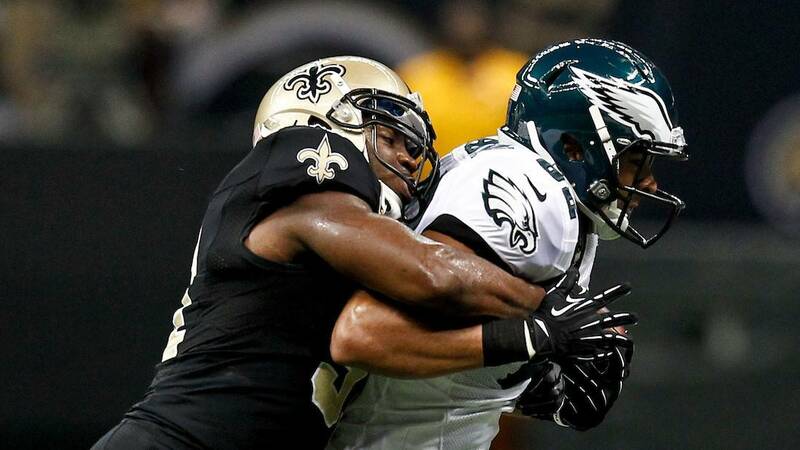 The (8-1) New Orleans Saints will be seeking their 9th straight victory this coming Sunday when they host the visiting and defending World Champion Philadelphia Eagles at the Mercedes-Benz Superdome. Kickoff is at 3:25 P.M. Central time and will be broadcast nationally by FOX Sports. Despite their (4-5) record and “Super Bowl hangover”, the Eagles are still one of the more dangerous and competitive teams in the entire NFL, led by 3rd year QB Carson Wentz. The Eagles haven’t played in the Crescent City since their former head coach Andy Reid (now with the Chiefs) was still with their organization, in a 28-13 defeat to the Saints back during the 2012 regular season. The last time that New Orleans and the current champs faced each other was in 2015 at Lincoln Financial Field in Philadelphia; in a game in which the Saints were beaten soundly by a score of 39-17. 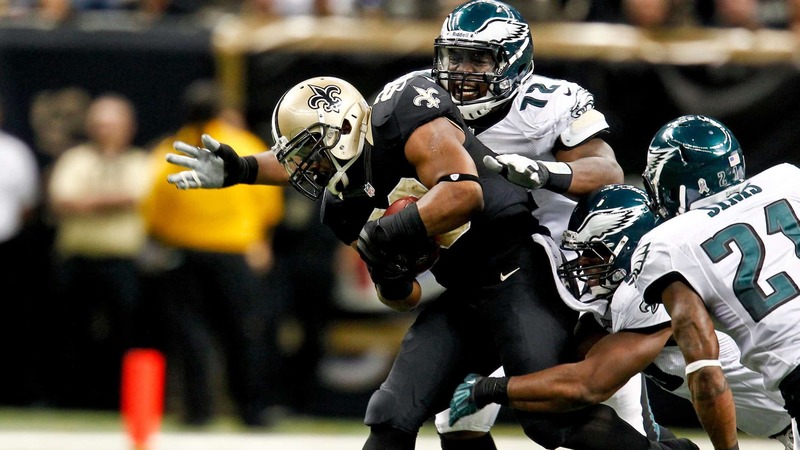 The Eagles had five sacks that day against Drew Brees and forced four turnovers, led by defensive tackle Fletcher Cox. It’s with all of that in mind this morning, that the Big Easy Magazine presents 5 bold predictions for this Sunday afternoon’s contest as New Orleans attempts to win its 8th straight game in a row; at home inside of the Mercedes-Benz Superdome against the always-dangerous and defending World Champion Philadelphia Eagles. The Saints have been busy in the past week and a half at the wide receiver position; originally signing former Dallas Cowboys All-Pro wide receiver Dez Bryant to become the team’s new #3 wide receiver, but then he tore his Achilles tendon in practice just two days later. He is now out for the rest of the year on injured reserve. Then, a few days ago on Monday morning, New Orleans once again signed yet another veteran wide receiver (essentially to replace the loss of Bryant — who was actually replacing previously-injured starter Cam Meredith) when they added 13-year veteran and former six-time Pro Bowl selection, Brandon Marshall. Marshall should provide the Saints the “big-bodied target” at the possession/slot wide receiver position that they’ve lacked since the departure last season of Willie Snead (now with Baltimore) and the recent loss of Meredith; to go along with clear-cut #1 wide receiver and soon-to-be All-Pro Michael Thomas. 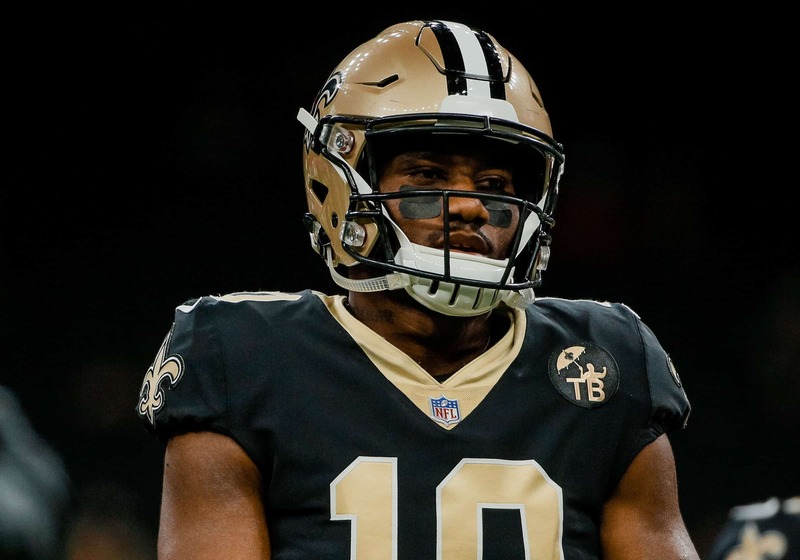 However, the one wide receiver that seemingly has gone overlooked this season is rookie and current #2 wide receiver Tre’Quan Smith. The talented player who, with very little notoriety, has quietly had a solid season thus far with 12 catches for 214 yards and three touchdowns for a New Orleans offense that has several star players on a squad averaging an NFL-best 36.7 points per contest. And while the soon-to-be 23-year old out of the University of Central Florida isn’t considered one of those “star” players quite yet (and actually wasn’t even targeted once in last week’s 51-14 rout over the Bengals at Cincinnati); it’s Smith who will end up having one of this coming week’s most spectacular plays. Early in the 1st quarter on a 3rd down-and-8 at their own 22-yard line, Saints quarterback Drew Brees side-steps a hard-rushing Eagles defensive tackle Fletcher Cox and fires a strike down the left sidelines to a leaping Smith, who uses every single bit of his 6-foot-2 inch frame to miraculously reach around behind his own head and snag the pass one-handed over Eagles backup cornerback Rasul Douglas. He then somehow manages to hang on to the ball without having been touched, before taking it the rest of the way for a 52-yard touchdown. Later that night, a very proud and smiling Tre’Quan talks about the recounts as his remarkable feat is selected as the #1 play on ESPN Sports Center’s Top 10, earning himself some well-deserved recognition along the way. The Eagles’ main issue on offense (and the one obvious strength of the New Orleans defense which only yields 80.1 yards per game) is their lack of a running attack — which experienced a huge loss when their starting #1 running back Jay Ajayi tore the ACL in his knee earlier in the year. Since that time, Philadelphia has attempted to replace Ajayi with a “running back by committee” (handful of back-ups), none of whom have emerged as a competent replacement. In the Eagles’ loss against the Cowboys last week, the back-ups (Wendell Smallwood, Corey Clements, and rookie Josh Adams) combined only managed to run for 64 yards rushing on 14 total carries. Simply put: none of them have been able to make quite the same impact that Ajayi did. That’s good news for the Saints run defense, who although they’ve dramatically improved in that category in the past year, have still shown a knack on occasion for allowing running backs to rip off huge runs at least once a game; though they do eventually settle down and shut down the opponent’s run game. But the Eagles will have no such luck in this contest, as the Saints run defense stuffs the entire committee of the Philly running game to 27 total carries for 72 yards, a 2.8 yards-per-carry average. As a result: Philadelphia is forced to become one-dimensional and constantly throw the football — which unfortunately is a much different issue to deal with for the Saints defense. One thing not mentioned in the previous prediction: last week the Eagles only rushed for just three first downs; which was what forced them to become one-dimensional. That would seem to suggest that the Philadelphia game plan on offense in this Sunday’s contest at the Superdome will be to attack the Saints secondary as early and as often as they possibly can via the air. As of this moment in spite of their rather notable improvement at defending the pass in recent weeks, the Saints defense is giving up 296.1 passing yards per game; which ranks them 31st overall out of 32 teams. Make no mistake: Eagles’ head coach Doug Pederson will have Philly “slinging the rock” in this one. Without question, the New Orleans secondary — in spite of how well they’ve been able to improve in recent games — will be tested by Wentz, who has 191 completions out of 269 attempts for 2,148 yards; with 15 touchdowns and 3 interceptions and an impressive completion rate of 71%. Undoubtedly, Wentz will look to challenge the Saints with the wide array of weapons that he has at his disposal; chief among them being All-Pro tight end Zach Ertz, who along with Kansas City tight end Travis Kelce, has emerged as one of the best young tight ends in the entire sport of pro football. In the nine games he’s played this season, Ertz already has 75 catches for 785 yards and five touchdowns. Unfortunately for the Saints defense, the Eagles also have a few more elite-caliber pass-catchers to go along with Ertz, at the wide receiver position, led by #1 wide receiver Alshon Jeffery and recently-acquired #2 wide receiver Golden Tate, whom they made a trade for with the Detroit Lions. Wentz and company are able to hang around and keep the score close, as he throws for over 300-plus yards and three touchdowns, including two long touchdown completions to Tate — who has burned the Saints’ secondary more than a few times in the past when he was with the Lions. If there is one major weakness that Philly has which clearly stands out from the rest and is one that potentially could tilt the game heavily in the favor of New Orleans, it’s with the extremely vulnerable Eagles defensive secondary. As initially reported by Phily.com Eagles beat writer Zach Berman: Philadelphia was dealt a huge blow last Sunday night, when their #1 cornerback Ronald Darby tore the ACL in his knee during the Eagles’ 27-20 defeat at home to the Cowboys. Darby was by far Philly’s the most talented player at the corner position, for a secondary that’s been burned time and time again by opposing pass offenses this season. Darby had started all nine contests this season, with 12 PBU’s and one interception. As of now, their game plan is to play two untested rookies and a slightly-below-average journeyman who’s already been cut by three different teams in the past three years (Rasul Douglas, Chandon Sul, Ivan and Cre’Von LeBlanc) at cornerback when they face the Saints. Translation: things could get downright ugly for the visiting Eagles this weekend. Long story short: the Eagles’ secondary as of this moment is somewhat “exposed” in a sense, since they are very susceptible to getting shredded like cheddar cheese by an average quarterback, much less a future 1st ballot Hall-of-Famer like Drew Brees. Brees this year has completed 235 passes on 304 attempts for 2,601 yards in nine games, and he leads the NFL in completion percentage (77.3%), touchdown-to-interception ratio (21 touchdowns to only 1 interception), and passing efficiency (an impressive 123.1 rating). And although Philadelphia most definitely boasts a stellar defensive line that obviously rattled Brees the last time that these two teams (including the previously-mentioned Cox along with Michael Bennett and Chris Long) met, they’ll be hard-pressed to do that again facing a Saints team that now has the #1 top offensive line in the entire NFL (yielding a League-low nine sacks). In other words, the Eagles secondary is in extreme danger with the loss of Darby, and it’s very likely that Brees and the Saints passing attack will look to exploit that glaring weakness. Brees will have the best day of his remarkable 2018 season thus far: 448 passing for 448 yards and 4 TD’s, to lead the Saints to a very productive day on offense. In that game, then-Eagles quarterback Sam Bradford was able to overcome two red-zone interceptions and threw for 333 yards and two touchdowns, while on the other side of the ball, Philadelphia defensive tackle Fletcher Cox forced two sack-strip-fumbles against Drew Brees — who had three turnovers in the contest that led to 17 points for Philadelphia. The Saints fell to (1-4) on that very forgettable day for Who Dat fans. 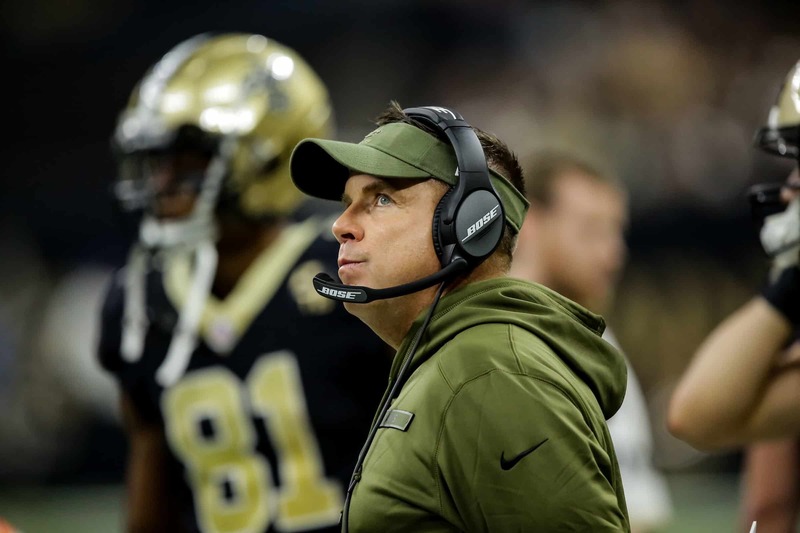 One thing that you can be awfully certain of: even though the Eagles have a different coaching staff now (current New York Giants head coach Pat Shurmur was their coach at that time), you had better believe that Payton hasn’t forgotten about that game, or how embarrassed that he felt on the sidelines that day. He’ll give us “coach speak” and tell the media that it didn’t mean anything leading all the way up to the very kickoff of the game itself, but we all know that he’s essentially full of it. Trust this much: he remembers it VERY well. 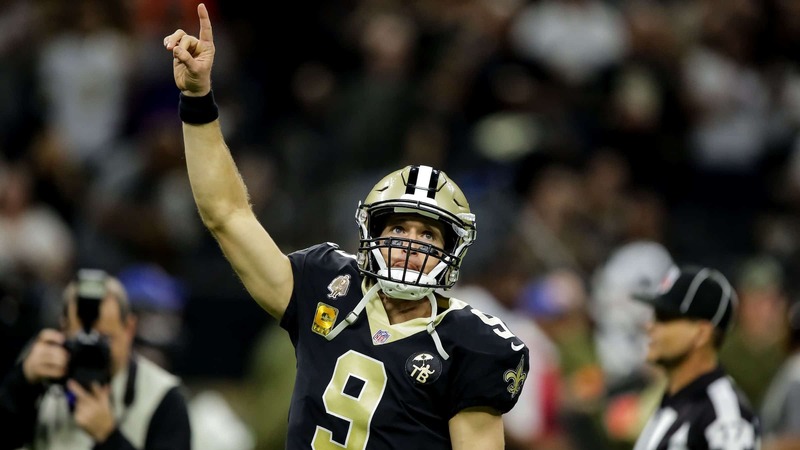 As a result, it’s one of the reasons that he allows Brees to take advantage of the previously-mentioned vulnerable Eagles secondary (448 yards and four touchdown passes as we just noted); and with the Saints ahead comfortably by a score of 38-17 going into the 4th quarter, dials up a play-call that has Brees throw a 65-yard bomb to wide receiver Micheal Thomas on a “flea-flicker” trick play for a touchdown, to put New Orleans over the 40-point mark for the 6th time this season alone. 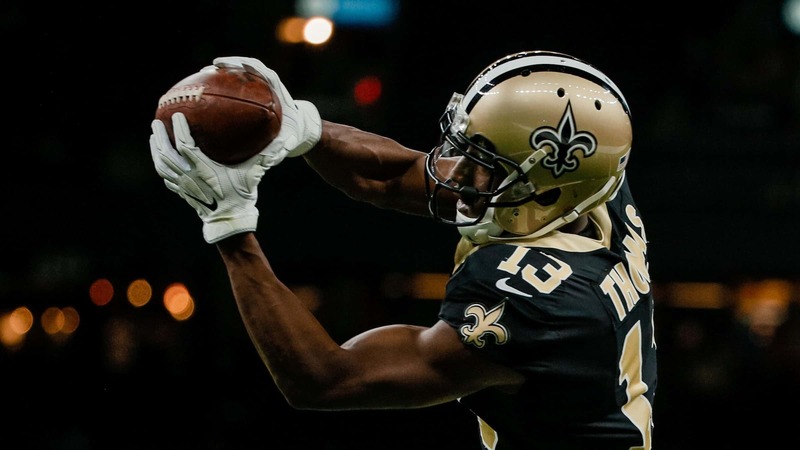 Thomas, whose jaw-dropping 89.7 catch rate leads all NFL receivers, and who additionally is looking to become the Saints’ first-ever All-Pro wide receiver in the team’s entire 52-year history, spikes the ball emphatically as he crosses the goal line and “throws up the X”; sending a proverbial message to the Eagles and the rest of the NFL that there will be a different World Champion in 2018 — and that it’s the Saints who plan on being that team. Which means of course that the Saints will win this one going away, even though Philly manages to hang around for a while, adding 10 points on the scoreboard late to make the final score closer than it seemed. Barry Hirstius is a semi-retired journalist, who has worked as a sports editor and columnist and regularly appears on ESPN Radio New Orleans 100.3 FM “The Sports Hangover Show”. Barry is a New Orleans native who grew up as a fan of the Saints while attending games as a young boy at the old Tulane Stadium. He is the proud Grandfather of two beautiful young girls, Jasmine and Serenity. You can view his other articles here. It is a game where we need to be focused when we do not have the ball.